The Upper West Side's Pomander Walk is a gated secret street tucked between Broadway and West End and West 94th and 95th streets. If you feel like you’re on a movie set while strolling down Pomander Walk, you’re not far off. 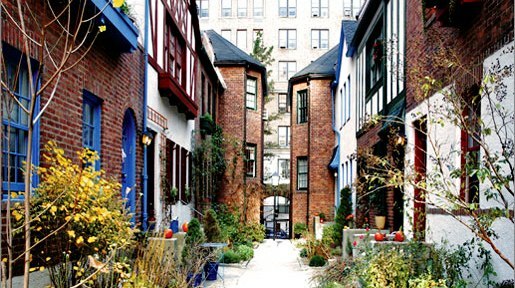 The picturesque jewel of the Upper West Side features 27 Tudor-style homes and is named after a romantic-comedy play called Pomander Walk, which was set in London. The Walk itself (which is private and gated—gapers are not encouraged) runs from West 94th to West 95th Streets between Broadway and West End Avenue. Its residences vary in size and color. Some have blue shutters and doors, some have red shutters and doors, but they’re all completely charming. Old-timey sconces and streetlights also dot the walkway, adding to the appeal. In 1982, Pomander Walk became a New York City Landmark.